Protein Microarray Reaction Buffer for reacting PlasmaScan™ 80 Antibody Microarrays with plasma protein samples and secondary staining reagents. 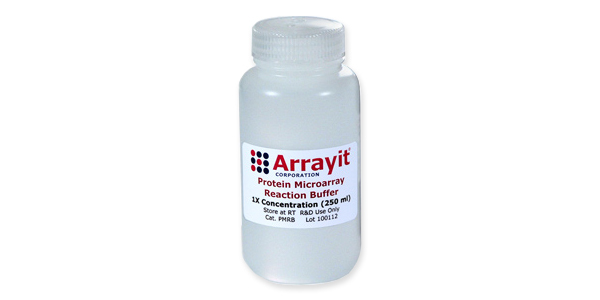 Arrayit Protein Microarray Reaction Buffer can also be used for binding and staining reactions on all other types of protein microarrays including microarrays of antibodies, antigens, peptides, cell extracts, and others. 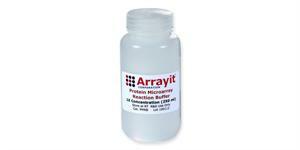 Arrayit PMRB is supplied as 250 ml of 0.1 µm filtered 1X solution, arrives ready to use, store at 20-25°C.